Liquified Natural Gas (LNG) is natural gas that has been chilled to liquid form, reducing it to one-six-hundredth of its original volume for transportation by ship to destinations not connected by pipeline. The PNG LNG project aims to exploit gas resources of the PNG Southern Highlands and sell the resulting LNG (Liquified Natural Gas) on the open market, particularly to Asia. This will be the largest industrial/development project in PNG’s history - it is projected to completely transform the PNG economy. It is one of the largest, if not the largest, development project in the Pacific region, excluding Australia. The official economic impact survey commissioned by the project sponsors claims that it will double the size of the PNG’s Gross Domestic Product. A gas pipeline running onshore from Juha to Hides, then to the coast near Kopi, then offshore to the LNG plant site. New onshore production facilities in the highlands, including a production facility at Juha and a conditioning plant at Hides where the condensate from the gas will be collected and transported by pipeline to Kutubu. A LNG processing and liquefaction plant near Port Moresby, plus a nearby export jetty and numerous marine offloading facilities. Full construction is planned to commence early 2010 and first LNG sales are due early 2014. 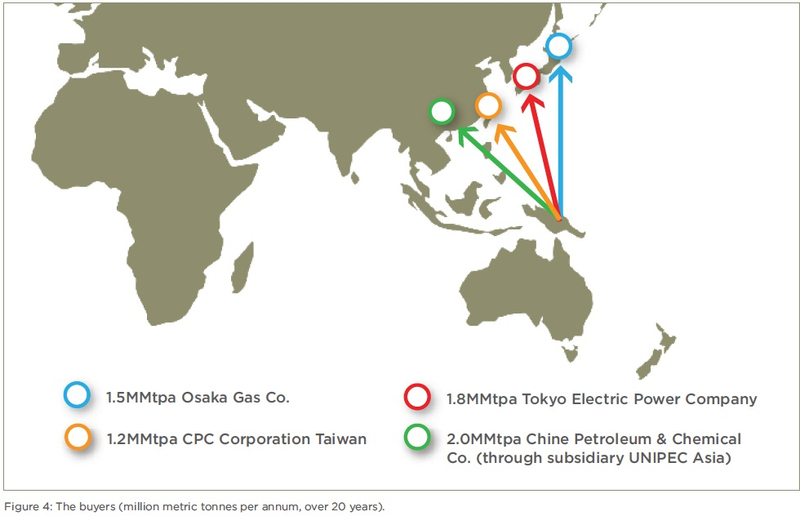 Long-term supplies have been secured to CPC Corporation in Taiwan, Osaka Gas Limited Company, Tokyo Electric Power Company Limited, and Unipec Asia Company Limited, a subsidiary of China Petroleum and Chemical Corporation. The project will have a capacity to produce 6.9 million metric tons of the fuel a year. On December 15, 2009 the Italian export credit agency, SACE agreed to cover 900 million Euro for contracts to Saipem and Nuovo Pignone, which are financed by Banca Intesa and Unicredit. Thus SACE is financing the project through the project finance component. On December 15, 2009, The Japan Bank for International Cooperation (JBIC) signed a loan agreement in the aggregate amount of up to 1.8 billion US dollars to be implemented in Papua New Guinea (PNG) with its project company, Papua New Guinea Liquefied Natural Gas Global Company LDC. The loan, provided in project financing is co-financed with a commercial bank syndicate (including Sumitomo Mitsui Banking Corporation, Mizuho Corporate Bank, Ltd. and The Bank of Tokyo-Mitsubishi UFJ, Ltd.) and overseas export credit agencies (including The Export-Import Bank of the United States, The Export-Import Bank of China, SACE S.P.A. in Italy, Export Finance and Insurance Corporation in Australia) and Nippon Export and Investment Insurance (NEXI). On December 8, 2009, the Australian goverment agreed with a $US500 million loan. The loan is to be provided to the project sponsors through Australia's Export Finance and Insurance Corporation (EFIC). On December 8, 2009, the final deal between the project sponsors and the PNG government was signed, the day of the Final Investment Deadline (FID). In October 2009 JBIC (Japan Bank for International Cooperation (JBIC), a big player in the global energy finance sector, signed an understanding with the Papua New Guinea Government to support the development of the multi-billion project. The MoU now puts PNG on the list of JBIC beneficiaries and comes with just over a month left before developer ExxonMobil makes its final investment decision. Read more. 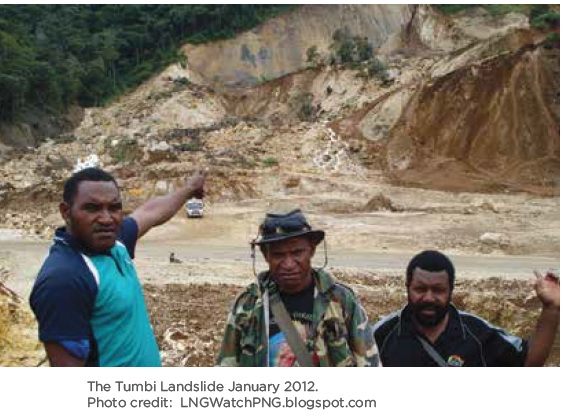 On October 28, 2009 the PNG government approved the Environmental Impact Statement for the PNG LNG project. The project continues to be dogged by disputes with local landowners who are supposed to also have a stake in the project. In July 2009 the sponsors of the project were still seeking $2 billion in project finance bank debt to partially fund the deal. They were proposing a 15-year deal, comprising a five-year construction phase and a 10-year pre-completion phase. The average life after completion is 7.75 years. Project financing is just one part of an $11.7 billion multi-sourced senior debt package needed to fund the project, expected to be the largest oil and gas project in the Asia Pacific region when completed. The project is seeking to raise approximately $11 billion in debt financing and anticipates a final investment decision will be taken in late 2009. In addition to the project financing deal, the sponsors are planning to raise up to $2 billion in bonds and $4.2 billion from export credit agencies in the form of direct loans or guarantees. In January, 2009, the LNG-PNG project sponsors organized a visit to the site of a new liquefied natural gas facility for participating ECAs from Ex-Im, Italy (SACE), Japan (JBIC), Korea Ex-Im, KEIC (Korean Export Insurance Corporation) and EFIC (Australia), as part of the lenders' fact-finding "due diligence" process. On 22 May 2008, the Project joint venture participants and the PNG State formally signed and executed a Gas Agreement. The Gas Agreement establishes the fiscal regime and legal framework by which the PNG LNG Project will be regulated throughout its lifetime. It also sets the terms and mechanism for State equity participation in the Project. The Gas Agreement was signed on behalf of the State of PNG by the Minister for Petroleum and Energy, the Hon. William Duma MP and by the Project’s joint venture participants at a ceremony in Parliament House. On 18 September 2008, the National Parliament passed, unopposed, bills to amend legislation as agreed under the terms of the Gas Agreement. The bills update the various Acts to reflect the terms of the Agreement. Banks involved in the PNG LNG project must immediatly stop their funding in this dodgy deal. The project´s Social Impact Assessment (SIA) indicates that an estimated 80% of the construction workers will be expatriates, meaning a large influx of workers can be expected to pose the same risks as were manifested on other similar projects of this scale. The influx of thousands of mostly male workers who are necessary to construct the project can lead to an increase in violence and sexually transmitted diseases in local communities and an increase burden on community health, human services and other social infrastructure. The impact of HIV/AIDS can be a two-way catastrophe, with increased exposure from expatriate workers to local people and from local people to expatriate workers who then move on to infect other people in other countries once they leave the project area. Societal impacts of the Project so far include an increase in destructive social practices. The influx of temporary workers and money has been linked to the exacerbation of existing social problems, including prostitution, gambling, drug abuse and alcohol abuse. The PNG LNG project will result in involuntary resettlement, including resettlement of indigenous people. Up to date an involuntary resettlement plan and a draft Indigenous Peoples Resettlement Plan has been completed, despite the fact that irreversible project decisions may have already been made and construction is soon to commence, if not already started. Construction of the onshore pipeline will have significant and irreversible environmental impacts on the existing environment. Environmental impacts from construction of pipeline Right of Way (ROW) include stripping of native primary forest and other vegetation of varying conservation value, exposure of top soil causing erosion and potential soil contamination from the construction process. In order to install the onshore pipeline a total of approximately 2,809 ha of land will be cleared, half in areas not previously disturbed by oil and gas developments. A Right Of Way (ROW) of 30m to 60m will be required and the pipeline will cross 26 major water crossings, 138 minor water crossings and will cross the Kutubu Wildlife Management Area. A 10m ROW will be retained for access road to the pipeline after completion of the pipeline. 1055 hectares of primary tropical forest will be cleared and an estimated 86% of primary tropical forest losses and 82% of losses in Classes A1 and A2 (1,220 ha) are concentrated in five broad vegetation groups. Erosion is specifically an issue in areas of step grades (20%-50%) and may result in increased sediment in waterways and erosion. The most significant environmental incident so far was the fatal mudslide at the Tumbi quarry in January 2012, which led to the death of at least 26 and as many as 62 people, mainly migrant workers, and the destruction of 42 homes. The PNG LNG project also proposes a 407 km offshore pipeline from Omati River Landfall to Caution Bay and a new LNG facility in Port Moresby. The pipeline will traverse the Gulf of Papua. Impacts from the laying, testing and operation of the pipeline include increased sedimentation rates resulting from trenching. Increased sedimentation reduces light penetration and stunts growth of marine biota. LNG liquefaction plants typically rely on their own supply of gas as a source of power to supercool gas for export. The use of this gas as a power source results in pollution emissions of NO2, SO2 and PM10. The PNG LNG project is anticipated to have significant greenhouse gas emissions, contributing to climate change. 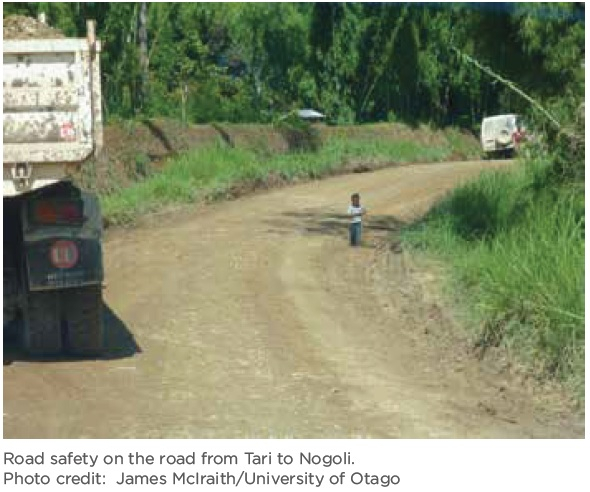 Papua New Guinea (PNG) landowners and other non-state actors have increasingly expressed frustration over the PNG LNG project’s potential impacts and lack of adequate benefits sharing. The recent incident of landowners commandeering a gas plant obviously raises the potential for similar or more direct action aimed at PNG LNG that the company and the PNG government could perceive as a security risk. Invariably, under such circumstances private or public security services will be retained to protect perceived assets. Unfortunately, there is a long history of such security forces committing severe human rights abuses, especially on extractive industry projects, including by some of the corporate actors associated with this project. Such a potential for violence and human rights abuses also greatly increases a diverse set of risks for potential public and private financiers. Regular instances of violence, disputes and unrest, some of which have turned deadly, have occurred over employment opportunities and political interference in the distribution of benefits. Inequalities have been exacerbated by the rising cost of food, since this may benefit those who have been able to capture revenues from the Project, while causing harm to those who have not been so lucky . Recently, a front end engineering and design contract was awarded to Eos, which is a joint venture of the Australian firm, WorleyParsons, and the US firm, Kellogg, Brown and Root (KBR). On September 3, 2008, Mr. Stanley, a former CEO of KBR, pleaded guilty to helping orchestrate a scheme involving $182 million in bribes paid to secure engineering, procurement and construction contracts for the Nigeria LNG project, Bonny Island, Nigeria. In February 11, 2009, KBR pled guilty and agreed to pay jointly with Halliburton $579 million in penalties in the second largest Foreign Corrupt Practices Act criminal fine in history. 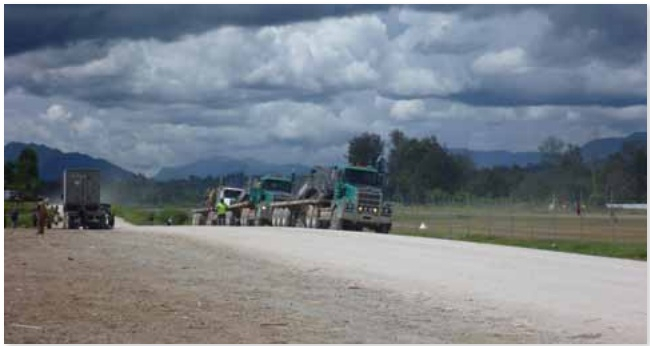 Now, KBR is playing a similar contractor role on PNG LNG. Potential funding of the project will benefit KBR and will send a message that corruption is being rewarded, rather than punished. PNG is already one of the most corrupt countries in the world, and the oil and gas sector is, along with the forestry sector, beset with corruption. So far, the PNG government has steadfastly refused to sign the Extractive Industries Transparency Initiative (EITI), the international standards that require signatory governments to publicly report revenues from oil, mining and gas ventures so as to decrease the opportunity for corruption and waste by state officials. By remaining a non-signatory of these standards, the PNG government officials are keeping themselves outside of any requirements to be transparent about how to spend the windfalls that will be coming to PNG. Oversight for the LNG Project is in the hands of Arthur Somare, Public Enterprises Minister and son of the Prime Minister Michael Somare. In theory, the PNG Governement’s 19% stake in the deal is supposed to be controlled by the state-controlled oil and gas corporation Petromin. However, control of the PNG LNG project has been handed over to the Independent Public Business Corporation (IPBC). The IPBC, it is alleged, is controlled by Arthur Somare, who will therefore be able to control be able to direct the dispersal of the revenues once they start to flow into the country. Somare was able to raise the PNG Government’s stake in the project by securing a billion-dollar loan from the Abu Dhabi Government, for which he has been criticised. The sharp increase in the size of the PNG oil and gas export sector will have dangerous distortional effects on the rest of the economy. The most recent economic indicators from PNG show that Dutch Disease is spreading, with the country's forestry, agriculture and fisheries industries worst affected by the inflationary effects and appreciating currency that have resulted since commencement of the PNG LNG Project. These non-mining, oil and gas export sectors are suffering from a sharp surge in manufacturing costs and increased competition from foreign imports. The government revenues received over the life of the Project will be very large, yet will not necessarily ‘spread throughout the economy' as predicted, nor provide long term improvements in the quality of life for the people of PNG. The result of this may well be increased local opposition to the Project increasing risks to the Project and the banks that financed it. Pipe Dreams: the PNG LNG Project and the future hopes of a nation-The report published by Jubilee Australia in December reveals that "There are serious risks that the revenues generated by the Project will not mitigate the negative economic and social impacts of the Project. In fact, it is very likely that the Project will exacerbate poverty, increase corruption and lead to more violence in the country". Pipe Dreams has uncovered more evidence that the process leading up to the signing of the PNG LNG deal was compromised by a desire on behalf of both the PNG Government and the companies to prioritize the hasty sign-off over all else. As with many similar project finance arrangements in other parts of the world, the structure of the deal theoretically places an unreasonably large share of the risk, should things go wrong with the Project, on the Government and thus the people of PNG. However, these risks may well boomerang back to you. Furthermore the project sponsor now seeks additional funding to complete the Project which has experienced cost overruns due in part to the lack of anticipation of local conflict. Sinopec in February 2011 joined the LNG project by signing the China's second-largest gas purchase agreement, worth around $US85 billion ($A80.7 billion) over 20 years by one estimate. The deal gives Sinopec 15 per cent of the Australia Pacific liquefied natural gas (LNG) project. Sinopec will pay $US1.5 billion for the stake in the project, completing a preliminary deal agreed in February with project developers ConocoPhillips and Origin Energy Ltd. The final deal between the project sponsors and the PNG government was signed on 8 December 2009, the day of the Final Investment Deadline (FID). After completion of the financing arrangements in March 2010 the project moved into a full execution phase. The overall PNG LNG scheme is now at an early stage of a four-year construction period. At the current time design, pre-mobilisation and early site works are underway. Approximately 60,000 landowners are estimated to be directly affected by the project. PNG law mandates that all investment deals include benefit sharing agreements between landowners, the government and the company. One week before the FID, hardly any landowner groups had signed benefit sharing agreements. The debt package consisted of US$4.6 billion in commercial tranches, US$5.7 billion of direct lending from ECAs and a US$3.8 billion loan from the sponsor, ExxonMobil. The commercial tranches were divided into a US$2 billion uncovered term loan, US$800 million term loan guaranteed by Export-Import Bank of the US (US Eximbank), US$900 million guaranteed facility by the Italian ECA Servizi Assicurativi del Commercio Estero (SACE) and a US$950 million facility insured by Nippon Export and Investment Insurance. The ECA facilities are split into a US$2.2 billion direct loan from the US Eximbank, US$1.8 billion term loan from Japan Bank for Inter­national Cooperation, US$1.3 billion loan from the Export-Import Bank of China and US$350 million loan from the Export Finance and Insurance Corporation. All facilities have a tenor of 17 years, except for the US$2 billion uncovered tranche, which has a maturity of 15 years. There are 17 banks that participated in the syndication of the commercial tranches, including ANZ, Bank of Tokyo-Mitsubishi UFJ, BNP Paribas, Calyon, China Development Bank, Commonwealth Bank of Australia, Crédit Industriel et Commercial de Paris, DnB NOR Bank, Intesa Sanpaolo, Mizuho Corporate Bank, National Australia Bank, Natixis, Société Générale (SG), Standard Chartered Bank, Sumitomo Mitsui Banking Corporation, UniCredit and Westpac Banking Corporation. ExxonMobil’s New Guinea Nightmare: How a US government loan enabled an environmentally destructive project plagued by lethal landslide, police repression and civil unrest. U.S.: Cash for Exxon? Yes. Cash for Climate Change? No. 2009-09-12 00:00:00 | Pacific Environment et. al. 2010-02-08 11:41:21 - The LNG plant which will liquefy and load gas for export is expected to become a major pillar of the country's economy. But some people in the region are living in extreme poverty and activists say these large-scale projects will only benefit the rich instead of the poor, local population. D’Appolonia is the Italian engineering consulting company who did the environmental and social due diligence for the PNG LNG project. ACT NOW! is an on-line community of people who believe we can build a better PNG. A PNG where everyone is treated as equal, where government services meet the people's needs and we make wise use of our natural resources. A new report on the impacts of the multi-billion dollar LNG Project in Papua New Guinea highlights the industry’s achievements in addressing social change but warns of continuing major concerns that need to be addressed, a coalition of NGOs said today. 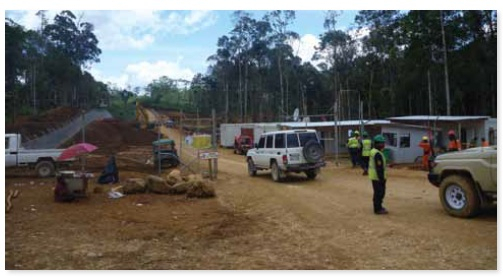 This investigative report by Jubilee Australia highlights circumstances, events and impacts associated with Exxon Mobil’s US $19 billion Gas Project in Papua New Guinea’s (PNG) Southern Highlands. Oxfam is lobbying Australian mining companies, financial institutions and the Australian government to make sure people come before profits. We’re also helping affected communities understand their rights to a decent livelihood and a clean environment, and to demand that companies allow them to have a say about mining projects in their area. The need for an independent watchdog on mining and its environmental and social impacts has never been greater. The Mineral Policy Institute remains the only civil society organisation which continues to focus solely on the full spectrum of mining issues – with the great irony being that despite the mega-revenues for the mining industry, funding for a mining-focussed NGO remains difficult to find.